Pork is back at nearly all of the fast food restaurant's locations, and that's great news for the business. If at any time this year you tried to order a carnitas burrito stuffing at your local Chipotle (NYSE:CMG) shop, there was a good chance you were turned down. The restaurant chain yanked the ingredient out of 33% of its locations in January after it suspended a pork supplier who was violating the company's animal welfare standards. Since less than 5% of the pigs raised in the U.S. meet those strict guidelines, the move left Chipotle without enough pork to go around as it scrambled to find more supply. That hunt is now over: Chipotle announced this week that pork is back on the menu at 90% of its locations. And investors have every reason to be as happy as carnitas fans about this tasty news. Chipotle did its best to try to contain the carnitas-shortage damage. It instituted rolling six-week pork blackouts so no single region of the country would have to go without the ingredient for too long. Management had hoped that this approach would keep things humming along more or less as usual. After all, customers could just switch to the chicken or steak options until carnitas came back to their market in a few weeks. But that's not how it played out. Pork fans chose to skip the Chipotle visit completely in many cases. "Our sales analysis suggest that our carnitas customers really love our pork, and they appear to be visiting less often or not at all, until they know we have carnitas in their market," an executive told investors in April. And to make matters worse, the rolling blackouts confused diners by keeping them guessing as to whether the ingredient was available. That meant customer traffic levels stayed depressed for a period -- even after carnitas returned to the menu. Chipotle estimates that the pork shortage crimped sales growth by 2 percentage points, which was one reason why it posted its weakest quarterly sales gain in over a year. 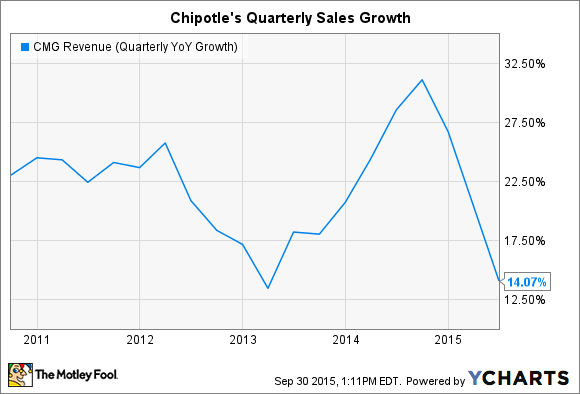 Chipotle also took a significant profit hit from the pork shortage. That's because management decided to hold off on raising steak prices at the locations that were missing carnitas so that they could avoid "having customers trade from carnitas to steak or barbacoa and then be forced to pay more for their meal," according to executives. On the plus side, the company generated plenty of goodwill by standing firm on its animal treatment practices. "Since making this decision, we have heard from thousands of our customers who have expressed support for our decision," CEO Steve Ells said in a recent press release. Any event that put the focus on Chipotle's "food with integrity" mission is likely a positive for the brand and the business, even if it does hurt short-term profits. And then there's the bounce back to look forward to. Chipotle's latest forecast, issued in July, calls for growth in the low to mid single-digit range for the full year (it posted 10% and 4% comps gains for the first and second quarters, respectively). That would represent a big slowdown from 2014's scorching 17% comp improvement. But investors should keep in mind that this outlook didn't account for the impact of carnitas making it back on the menu for much of the third quarter and the entire fourth quarter. That win will be giving a lift to customer traffic, sales, and profits. And assuming management is right about the fierce loyalty of carnitas fans, it's reasonable to expect the ingredient's return to push sales growth toward to top end of Chipotle's 2015 guidance, if not above it.